If you’re looking for Offer in Compromise software and support within your existing tax prep suite, you’ll be looking a long time! IRS Solutions Tax Resolution Software is the only tool that also gives you expert guidance for dealing with tax resolution problems. 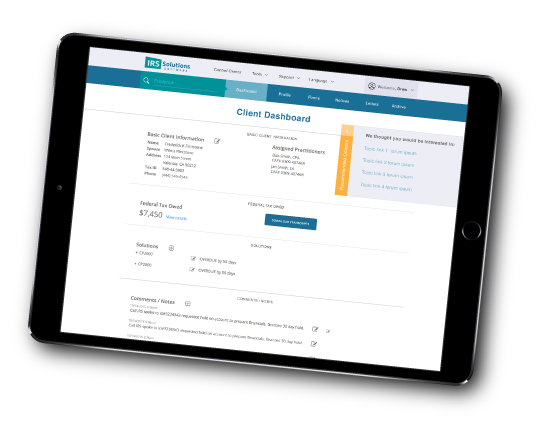 Created by former IRS insiders, IRS Solutions Software offers answers and a library of form letters that can be automatically populated and saved as a record when you’re helping a client through a tax resolution problem. Watch a quick tutorial on our Offer in Compromise Software. Tax pros keep telling us how easy it is to use. Try it on your next case and let us know what you think. 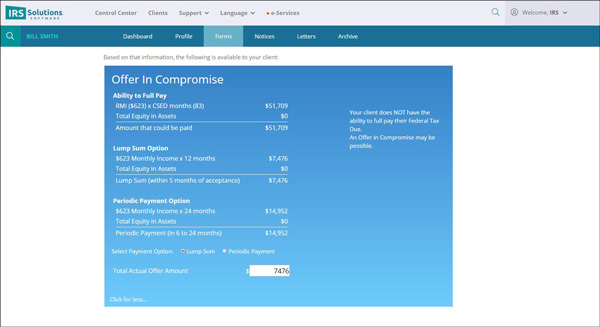 Using our “Negotiation Intelligence,” IRS Solutions Software calculates eligibility for an Offer in Compromise and gives you the best direction to go to solve the problem. You’ll have a library of form letters you can customize to create engagement letters, responses, and follow-up communications. The software populates the applicable forms, prints and archives them for easy submission. You can access the software from anywhere using your iPhone, iPad, android, or tablet to find the answer you need from the courtroom, a client’s office or home, even the beach! Are You Wondering What the IRS May Be Thinking About Your Case? IRS Solutions Offer in Compromise Software is continually updated to reflect the most up-to-date IRS rulings and processes. Find out here. Stop guessing. Quickly use the Offer in Compromise Calculator to find out what the IRS is likely to accept. If you decide to go another route, you will not have wasted hours of your time. Don’t promise your clients they will qualify to reduce their debt. It is important to do what you can to qualify clients upfront to avoid wasting your time and theirs. Let IRS Solutions do the heavy lifting.